Ancient Egypt is one of the most popular slot themes of all! In addition to Sphinx Mysteries, Novomatic also make: Queen Cleopatra, Gold of Egypt, Ramses 2, Pharaoh’s Tomb, Dynasty of Ra and Book of Ra. These are only a few of their Egypt-themed slots! Many slot game vendors other than Novomatic also love to make slots that take inspiration from this ancient civilisation. Ancient Egypt was one of the longest-standing civilisations in all of human history! The reasons why it was so successful are many and have been studied by historians. Archaeologists have uncovered many ancient Egyptian towns and tombs and they are still making discoveries today! Thanks to archaeologists and historians, we can decipher their language; we know how they buried their dead; we know about their gods and their religion and we even know what they ate and drank! In slot games like Sphinx Mysteries, Novomatic bring this civilisation to life! The background, the font and the symbols all come together and create a really cool Egyptian vibe. Of course, the game is great to play, too! 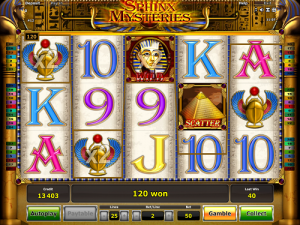 Sphinx Mysteries slot game has 25 paylines and 5 reels. It’s not a very complicated slot game but it pays well, especially when you trigger the Free Games! Built-in features include gamble and autoplay. It’s no mystery how you can get payouts in Sphinx Mysteries! Unlike some of the secrets of ancient Egypt, the payout rules are clear in this slot game. A beginner will find it easy to pick up the rules as the payouts and even the Free Games are pretty straightforward, too. Novomatic is really good for this; they don’t overcomplicate things – they just keep making great games that pay and entertain! Every time you spin the reels, new symbols will fall in new combinations. The more symbols you match up, the likelier it is that you’ll get a payout! Some symbols start to pay from two matches and other symbols only begin to give payouts from three matches. Five matches of any symbol will get you the biggest payout! Not every symbol gives the same payouts, as some symbols are quite rare and therefore the most valuable! The 9, 10 and Jack are at the lowest-end of the paytable. The Queen, King and Ace are more valuable. Going up the paytable, you’ll then find: the Eye of Horus, the hieroglyphic scroll, the golden ankh, the Anubis statue, the bejewelled Scarab beetle, the pyramid and the golden death mask of Tutankhamun. Identical symbols must fall adjacently following a payline from reel 1 to award payouts. The paylines aren’t fixed, you can play with a minimum of 1 and a maximum of 25. The two most valuable symbols on the reels, the pyramid and Tutankhamun’s mask, are special! The pyramid is the Scatter symbols and Tutankhamun’s mask is the Wild symbol. The Wild symbol doubles the win when it substitutes for another symbol in a win. It can’t substitute for the Scatter symbol. The Scatter symbol pays from any position and doesn’t have to stick to the same rules as the other symbols. 3, 4 or 5 of this symbol landing in one spin awards a payout as well as the Free Spins bonus! You get to choose which Free Games you want! There are 5 different options to choose from. You can choose to get between: 16 and 20 free spins with a x1 win multiplier; 13 – 17 free spins with a x2 multiplier; 11 – 14 free spins with a x3 multiplier; 8 – 12 free spins with a x4 multiplier or 5 – 10 free spins with a x5 multiplier.